Of course we expected something Christmassy and we clearly were not going to be disappointed. The first thing we noticed was the rather odd-shaped grid (and it is only now, blogging, that I see that it wasn’t symmetrical but with so much thematic material, I am perfectly happy to live with that!) Were we in for a Christmas tipple and mince pies? I checked to confirm Poet’s membership of the Listener Setters’ Oenophile.org and was rather dismayed to find only one tipply clue, ‘Oil producer with no time to empty barrels (4)’ [N] + TEEM less T(ime) + B. We had to know that TEEM was a word for ’empty’ and that the NEEMB was a name for the ‘nim tree’, an oil producer, as well as the B (barrel/barrels) abbreviation. This was no crossword for newcomers! Now that was a tough clue. It rather set the tone for the rest. We slowly worked our way through to HORT[A]TIVE, PARCA (a generous anagram! ), OL[O]R[O]SO, [D]ON[U]TS, [S]ERKALI, PHO[T]ISM, ALTO-CLE[F] and the other challenging across clues, wondering what those strange letters that we were storing at the side of our grid were leading to. 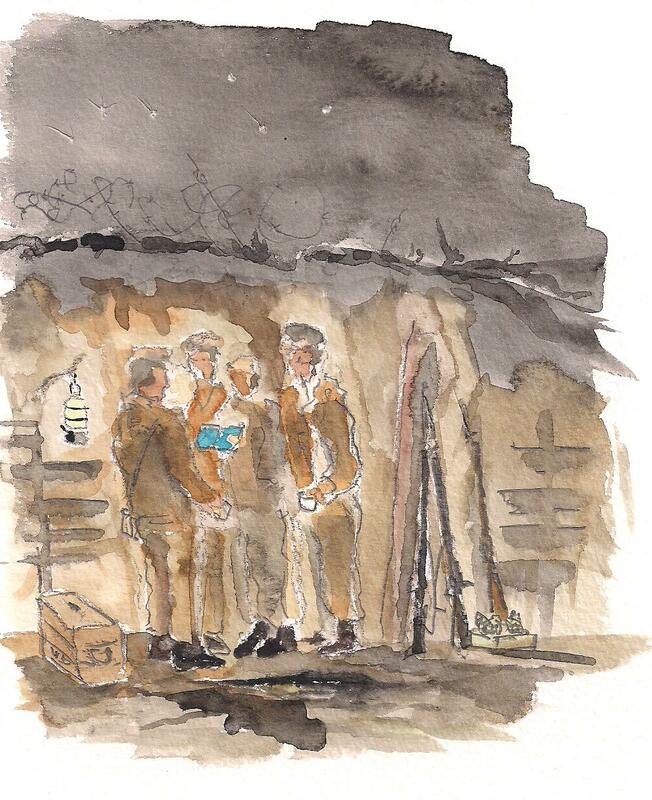 We’ve just returned from a trip to the UK and we were serenaded, whilst there, by the Sainsbury cashing in on the Christmas Day 1914 armistice in No Man’s Land so the other p.d.m.s came thick and fast. The J on the eastern side of our grid seemed to promise a JERRY and we putatively matched him to TOMMY and worked out that the remaining extra letters were going to give us NO MANS LAND. 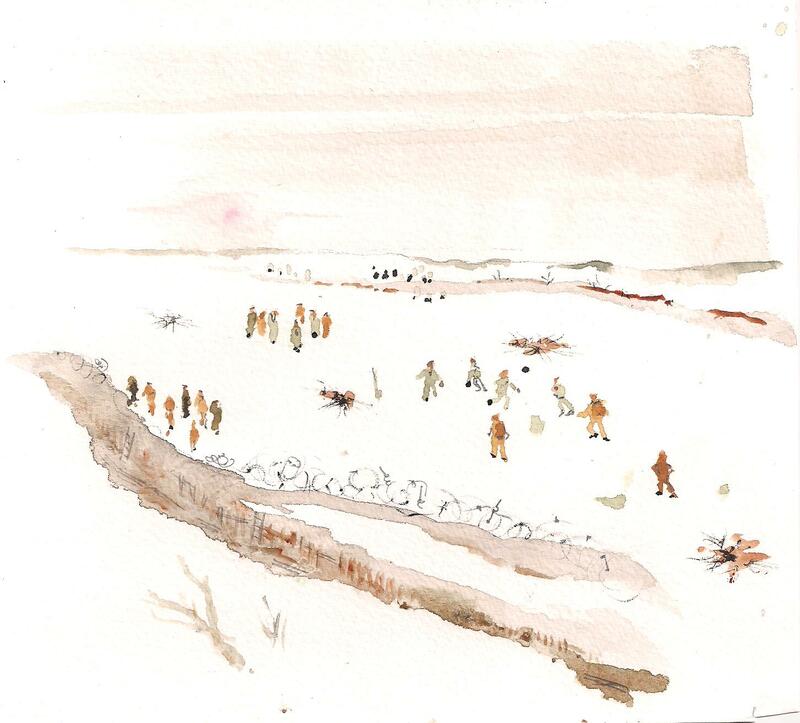 Next came that lovely moment when we realized that we were going to have CAROLS/ SOCCER/ SHORT-LIVED ARMISTICE and WESTERN FRONT and that the six letters we had to change to achieve that moment of peace were the six of BATTLE, which had to yield RELIEF. 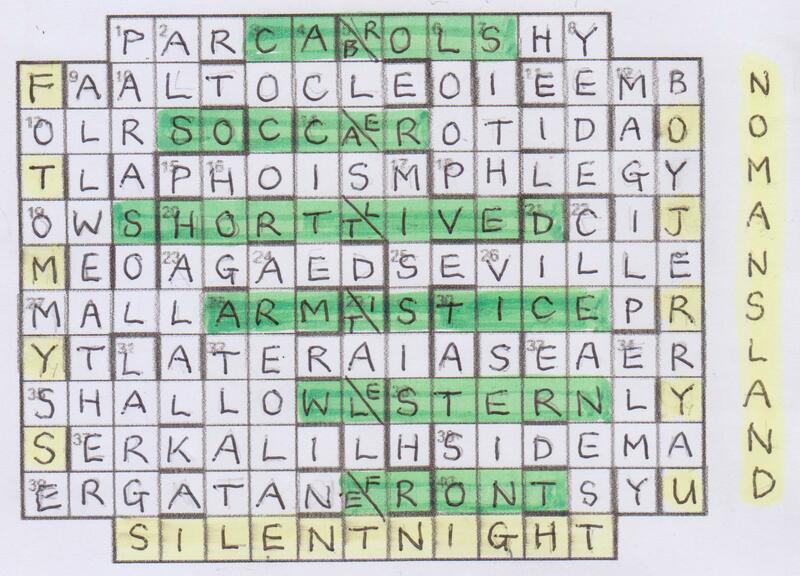 My admiration for Poat’s compilation swelled like the carol as all of this thematic material went into the grid.This is the kind of crossword I love, with masses of graphic thematic material creating a verbal picture. Filling our few final empty cells was a work of elimination. We still had to understand the nature of the original positions of the protagonists, and sure enough, the remaining letters yielded FOSSE, with TOMMY entrenched in the rat-infested place and JERRY on the opposing side in his rather superior constructions – his BOYAU. What a meaningful Christmas compilation. Many thanks, Poat. This entry was posted on 9 January 2015 at 4:00 pm	and is filed under Solving Blogs. Tagged: Christmas Break, Poat, Western Front. You can follow any responses to this entry through the RSS 2.0 feed. You can leave a response, or trackback from your own site. Thank you Shirley, but as far as tipples are concerned you are forgetting the seasonal sherry at 13a (and a minced form of PIES can also be traced in the grid, as it happens).